Hallo Ihr bietet hier auf 4 gut eingespielte Jensen Alnico P 10 R Speaker in 100 % technisch einwandfreiem Zustand. BUGERA TURBOSOUND TS-12G320A8 Guitar Speaker 8 Ohms 80W 12"
Tolto da un BUGERA V22 Infinium, 80 Watt su 8 ohm, cono da 12 pollici. Probably not the best speaker in the world but THIS one is in pristine conditions. 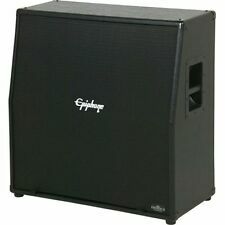 Epiphone So Cal Slanted Guitar Speaker Cabinet (280 Watts, 4x12 in.). Eminence Lady Luck speakers. The So-Cal 412SL is loaded with four Eminence speakers.When developing the Epiphone So Cal 412SL, speaker selection was a top priority and for that task the Gibson USA Design Team turned to the experts at Eminence. (TF card non inclusa). lettura TF card (fino a 32 G), che può riprodurre qualsiasi formato di musica. 5W uscita amplificatore per chitarra, con dispositivo di effetto di distorsione incorporato. uscita: 5W. Amplificatore per chitarra compatto da 5W, materiale ABS PC di alta qualità, super leggero e portatile. Potenza: 5W. Peso dell'oggetto: 270g / 9.5oz. Das Geheimnis des satten Klangs der BB-112?. Ein halb geschlossenes Gehäuse für ausgewogene tiefe Frequenzen und der 12” 8 Ohm Celestion V-Type Lautsprecher für saubere Höhen und kehlige Mitten mit viel Spielraum für Brillanz nach oben. Super rare celestion lead guitar speakers. Made in USA. Functional condition is described above. This item is in great condition and in working order. I'll be glad to answer anything…. HP GUITAR Speaker 12" AMPLI PROJET 8 Ohms. PROJET Custom. PROJET Custom. Functional condition is described above. This item is in great condition and in working order. I'll be glad to answer anything…. The JOYO TOP-GT is a mini and portable device that combines a guitar amplifier with a bluetooth speaker. As a guitar amp, it supports built-in distortion effect's VOICE, GAIN, TONE, VOLUME adjusting. And You can connect it to your guitar via the 6.35mm jack to practicing your guitar skills. You can also connect it to your smart device like iPhone/iPad/iPod touch via the 3.5mm LINK jack and enjoy the software effect pedal from the device. If you want to use it as an ordinary speaker, just connecting it to your CD player, MP3 or smart phone via the AUX jack or bluetooth 4.0, then you can enjoy music freely. Features: Compact size, 4W(L) 4W(R), 2-in-1 guitar amplifier and bluetooth speaker..
Das Geheimnis des satten Klangs der BB-212?. Ein halb geschlossenes Gehäuse für ausgewogene tiefe Frequenzen und der 12" 8 Ohm Celestion V-Type Lautsprecher für saubere Höhen und kehlige Mitten mit viel Spielraum für Brillanz nach oben. Wir sind ein spezialisierter Anbieter im Bereich E-Gitarre und Bass. Wir vertreiben ausschließlich Qualitätsmarken. SPL Transducer - Analog Microphone & Speaker Simulator. Product number: 218101 "SPL Transducer - Analog Microphone & Speaker Simulator". 12" Celestion®"-Lautsprecher (Spezialanfertigung). - 1/4"-Gitarreneingang. Line 6 Spider IV 75-112 Guitar Combo Amp mit 12' Celestion Speaker. Man hat wirklich alles an Board was man braucht. Der Combo-Amp wurde komplett getestet und alles funktioniert perfekt ! Pile KORG M1 M1R M1REX SAV Original Sounds 200 sons (#260551340376). Yamaha de 2000 styles Tyros 1 Tyros 2 Port Gratuit (#350019008002). Mar-23-10 12:13. 81jeanmarie (1 ). 27-Mar-08 11:23. Mar-19-10 05:16. Material: PP Plastic. Color: Black. The price is for 2PCS/lot. Height: 146mm. Width: 139mm. Panel Cut Out：. Biete Ihnen hier einen Mini Guitar Amp von SCURU, Modell S1. Power: 2 x 3 Watt (zwei Lautsprecher). oder grob fahrlässigen Pflichtverletzung unseres gesetzlichen Vertreters oder Erfüllungsgehilfen beruhen. Mini 3W 9V Guitar Ukulele Amp Amplifier Speaker. People always bought together with. A causa della misurazione manuale, potrebbero esserci errori di 1-2 mm. 1x amplificatore per chitarra. Feature: Model EM688 (model followed by the host name or host name is placed before) Product Features: with ultra-realistic tone of the classic metronome, supports linear input function mini Bluetooth speakers, Ren potential mining and play your music feeling 850mAh built-in rechargeable lithium battery, more convenient Beat Type: 0,1,2,3,4,5,6,7,8,9 Tempo: 30-250BPM A time when Type: 8 kinds of common rhythm pattern. Beat tone: mechanical bells, wooden fish sound, voice, analog electronic sound Package list:1 x ENO EM-688 Blue Brand ENO Item Type metronome UPC Does not apply MPN Does not apply EAN Non applicabile Marca Unbranded. 8” Custom VOX Lautsprecher. Lautsprecher: 8” 4 Ω. Vox VX II Verstärker für E-Gitarre Amplifier for E-Guitar. 8 klassische Effekte. Der VX II verfügt über 30 Watt Leistung und ist mit einem USB Port, JamVOX III und der neuesten Tone Room Software zum editieren der Verstärkermodelle und Effekte ausgestattet. Feature: Model EM688 (model followed by the host name or host name is placed before) Product Features: with ultra-realistic tone of the classic metronome, supports linear input function mini Bluetooth speakers, Ren potential mining and play your music feeling 850mAh built-in rechargeable lithium battery, more convenient Beat Type: 0,1,2,3,4,5,6,7,8,9 Tempo: 30-250BPM A time when Type: 8 kinds of common rhythm pattern. Beat tone: mechanical bells, wooden fish sound, voice, analog electronic sound Package list:1 x ENO EM-688 Black Brand ENO Item Type metronome UPC Does not apply MPN Does not apply EAN Non applicabile Marca Unbranded.